The Living Dead, (aka “Zombies”) have begun to rise from the dead and violently and indiscriminately attack and eat the living. Within weeks, society has collapsed entirely. Small groups of human beings survive: holed-up in schools, hospitals, and shopping malls, desperately fighting to stay alive. Only a few things are known about these “Zombies”: – They desperately crave the flesh and brains of the living. – They may only be killed by destroying their brains, via a bullet, incineration, or other extreme trauma. – They possess only a rudimentary intelligence, and seem to operate on instinct and very dim memories of their prior life. – Any person who dies will become a zombie within hours of their death. Those bitten by a zombie will become ill and eventually become zombies as well. 42 cartoonists from around the world have come together in 144 pages of raw, black & white comix, to describe this terrific sequence of events. Stories by Jerome Gaynor, John Connolly, Leela Corman, Mark Cunningham, Danno, Jennifer Daydreamer, Mark Early, Erik Farseth , Tom Hart, Jannelle Hessig, Graham Annable, Kevin Huizenga, K. Thor Jensen, Lee Kennedy, Megan Kelso, Dave Kiersh, James Kochalka & Jason X-12, David Lasky, Paul Lyons, Jim Mafood, Ted May, Jake Austen, Mr. Mike, Souther Salazar, Zak Sally, Matt Schultz, Anchovy Sciarrino, Jason Toon, Jeremy Wabiszczewicz, Adrian Todd Webb, Jeff Wilson, Gabrielle Bell, Jenny Zervakis, Dan Zettwoch, Eli Bishop, Ariel Bordeaux, Robyn Chapman, Chris Cilla, and Ezra Claverie. 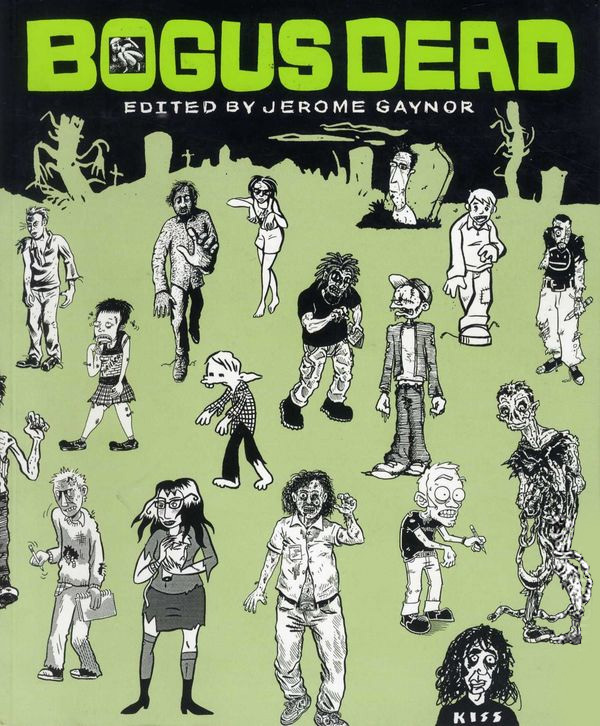 Jerome Gaynor has been publishing comics out of his home for over 10 years! His anthology “Flying Saucer Attack” was the predeccessor to “Bogus Dead”, and was a critical and popular success in underground comics circles. He also published 10 issues of “Funkapotamus”, mini-comics dealing with the fun & terror of growing up in the suburbs. 144 page black and white paperback with color covers.